The Hanukkah menorah, also chanukiah or hanukkiah (Hebrew: מנורת חנוכה menorat ḥanukkah, pl. menorot; also Hebrew: חַנֻכִּיָּה ḥanukkiyah, or chanukkiyah, pl. ḥanukkiyot/chanukkiyot, or Yiddish: חנוכּה לאָמפּ‎ khanike lomp, lit. : Hanukkah lamp), is a nine-branched candelabrum lit during the eight-day holiday of Hanukkah, as opposed to the seven-branched menorah used in the ancient Temple or as a symbol. On each night of Hanukkah, a new branch is lit. The ninth holder, called the shamash ("helper" or "servant"), is for a candle used to light all other candles or to be used as an extra light. To be kosher, the shamash must be offset on a higher or lower plane than the main eight candles or oil lamps, but there are differing opinions as to whether all the lights must be arranged in a straight line, or if the channukiah can be arranged in a curve. The hanukkiah, along with the seven-branched menorah and the Star of David, is among the most widely produced articles of Jewish ceremonial art. The hanukkiah is often displayed in public around Hanukkah time December. Elected officials often participate in publicly lighting the hanukkiah. The Chabad-Lubavitch movement is well associated with public lighting ceremonies, which it has done since a directive from their last Rebbe, Menachem Mendel Schneerson, in 1987. In the book A Kosher Christmas: 'Tis the Season to Be Jewish, author Rabbi Joshua Plaut, Ph.D. details the history of public displays of the hanukkiah across the United States, summarizes the courts cases associated with this issue, and explains how the Presidents of the United States came to embrace lighting the hanukkiah during Hanukkah. Since 1979, the White House has been represented at the lighting of the National Menorah in celebration of Hanukkah, beginning with the attendance of President Jimmy Carter in the ceremony in Lafayette Park. Additionally, beginning with President Bill Clinton in 1993, a hanukkiah is lit at the White House, and in 2001, President George W. Bush began the annual tradition of a White House Hanukkah Party in the White House residence, which includes a hanukkiah candle lighting ceremony. In the United Kingdom, the House of Commons of the United Kingdom each year holds a hanukkiah lighting at the official residence of the Speaker of the House of Commons, located in the Palace of Westminster. The hanukkiah currently used was commissioned by the Rt. Hon. Michael J. Martin MP, then Speaker of the House of Commons. Martin is a Roman Catholic; his successor, John Bercow, is coincidentally the first Jewish Speaker of the House of Commons. Two big hanukkiahs are in New York City, each standing at 32 feet. One is at Grand Army Plaza in Brooklyn, and the other is at Fifth Avenue and 59th Street in Manhattan near Central Park. A 4,000-pound structure, it is the work of Israeli artist Yaacov Agam. Because of the hanukkiah's heights, Con Edison assists the lighting by using a crane to lift each person to the top. President Carter, Hanukkah Menorah Lighting, Lafayette Park, 1979. In the United States, the public display of hanukkiahs and Christmas trees on public grounds has been the source of legal battles. Specifically, in the 1989 County of Allegheny v. ACLU case, the majority of the US Supreme Court ruled that the public display of hanukkiahs and Christmas trees did not violate the Establishment Clause because the two symbols were not endorsements of the Jewish or Christian faith, rather the two items are part of the same winter-holiday season, which, the court found, had attained a secular status in U.S. society. English speakers most commonly call the lamp a "menorah" or "Hanukkah menorah." (The Hebrew word menorah simply means "lamp".) In Modern Hebrew the lamp is generally called a chanukkiyah, a term coined at the end of the nineteenth century by Hemda Ben-Yehuda, whose husband Eliezer Ben Yehuda was the leading force behind the revival of the Hebrew language. 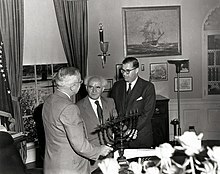 U.S. President Harry S. Truman in the Oval Office, receiving a hanukkiah as a gift from the Prime Minister of Israel, David Ben-Gurion (center). To the right is Abba Eban, the Ambassador of Israel to the United States. Many museums have notable collections of hanukkiahs, including the Israel Museum, the Metropolitan Museum of Art, and the Jewish Museum, which owns the Lindo lamp. There is also a collection in the small Jewish Museum in Rio de Janeiro. More offbeat Hanukkah products on the American market include a "Menorah Tree" inspired by the Christmas tree tradition, and even a "Menorah Bong". The "Thanksgivukkah" coincidence of Thanksgiving and the second night of Hanukkah in 2013 inspired a turkey-shaped "menurkey". ^ "Hanukkah Lamp, BD, Judaica, Ceremonial Art". The Jewish Museum. Retrieved 2018-10-06. ^ Silberberg, Naftali. "What Constitutes a Kosher Chanukah Menorah?". Chabad.org. Retrieved 2018-10-06. ^ "Do the candles on the menorah have to be in a straight line to be kosher?". AskMoses.com. Retrieved 2018-10-06. ^ "Is a curved Menorah kosher for Hanukkah?". About.com Judaism. Archived from the original on July 11, 2014. Retrieved 2018-10-06. ^ "Laws of Chanukah". Orthodox Union. 2010-11-25. Retrieved 2018-10-06. ^ Plaut, Rabbi Joshua Eli (2012). A Kosher Christmas: 'Tis the Season to Be Jewish. Rutgers University Press. ISBN 978-0813553795. ^ "Silver For The House Of Commons". Retrieved 2018-10-06. ^ "Lighting Largest Hanukkah Menorahs". Retrieved 2018-10-06. ^ "חנוכייה" [Menorahs]. State of Israel, Ministry of Education. Retrieved 2018-10-06. ^ "The Hanukkah Menorah". The Metropolitan Museum of Art. Retrieved 2018-10-06. ^ Sechan, Sarah (July 21, 2009). "London's Jewish Museum preparing to buy 300-year-old hanukkia for new location". The Jerusalem Post. Retrieved 2018-10-06. ^ "Museu Judaico do Rio de Janeiro". Retrieved 2018-10-06. ^ Newman, Andrew Adam (2016-12-21). 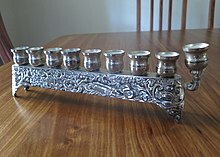 "From Yamaclaus to Menorah Bong: Hanukkah Goods That Can Hold a Candle". New York Times. Retrieved 2018-10-06. The bong is demonstrated at "The Grav Menorah". YouTube. 2014-12-19. Wikimedia Commons has media related to Hanukiah.